This is the second in the Office 365 and SharePoint Online series. 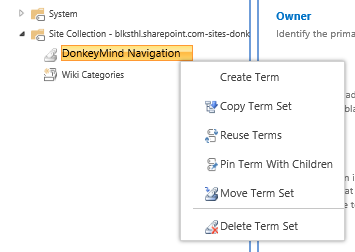 Use Managed metadata and the termstore to control your Navigation. This is not as complicated as it may seem, the difficult parts have been taken care of by Microsoft when setting up the ManagedMatadata Service Application for us. Navigation is part of the Publishing Infrastructure features in SharePoint, so in order to manage Navigation, the Publishing features must be activated. So if you do not already have it activated, lets do so now. 6. Next step is to go back to Site Settings, and locate the category Look and Feel and there you now have Navigation. In this guide, we will focus on the global, but in order to manage the current navigation follow the same steps. 9. We want to change the Global Navigation setting to Managed Navigation as below. 13. 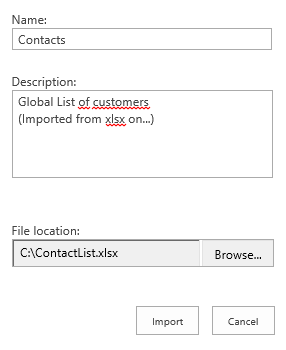 Click on the button Create Term Set and a termset for your navigation will be created. 15. This is were your navigation entries will be stored. 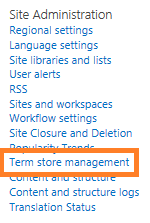 Next we will go to the Term Store Management Tool to start on our new navigation. 16. Before you do, notice the setting below the term windows, these settings will allow you to control what happens when new pages are created. 17. Make changes if you want to, I’ll just leave them as is, I will be creating subsites, not pages. 21. 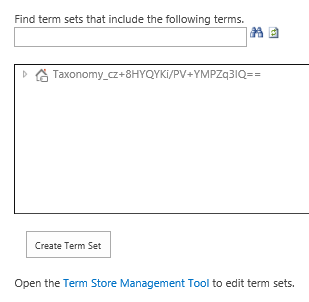 In the Term Store Management Tool, you will same as before, see some shared metadata and a site collection node. 22. 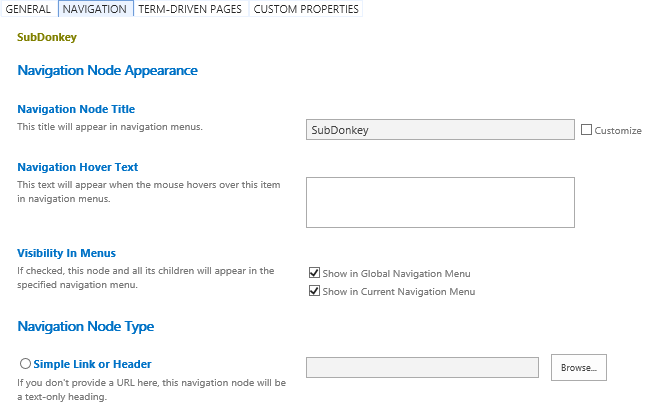 Expand the site collection node, now you will see the Navigation node we just created. 23. 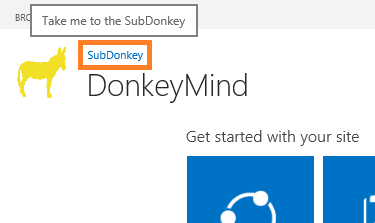 In this example, I will add an entry to the global navigation that is for a subsite I have created, named SubDonkey. It will only be one entry in the navigation and that will open my subsite SubDonkey. 27. A new empty termlabel will show up but simply click on the new term to make it go away. 28. When the new term is selected, you get a list of choices and configurations you can make. 29. You can here type in a description, add a second label, language and some more. Let this page be as it is. 31. This brings up a new page of navigation specific settings. 32. In here, I’m making a few modifications. 33. 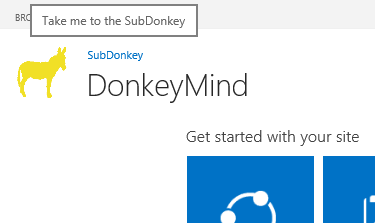 I add a Navigation Hoover Text: Take me to the SubDonkey. 36. select the icon for the subsite, like in my case, SubDonkey. 37. Click on Insert at the bottom right. 38. Verify your navigational settings for the new node. When done, hit the Save button. 39. Now you are done, go to your rootsite to verify the result. 40. Note the SubDonkey Navigational link with the Hoover Text showing (Mouse is over in image). 41. Repeat the steps 20 to 40 to add more terms and new nodes to your navigation. Do not be afraid of trying new things, link to pages, to external sites, you can always delete the node if you don’t like the result. 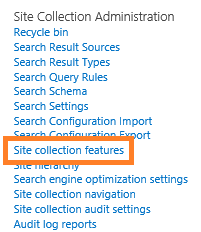 Note: All the same steps apply in SharePoint Online as well as SharePoint 2013 onpremise, you will need to first configure the Managed Metdata Sevice Application before any of these steps can be performed though. 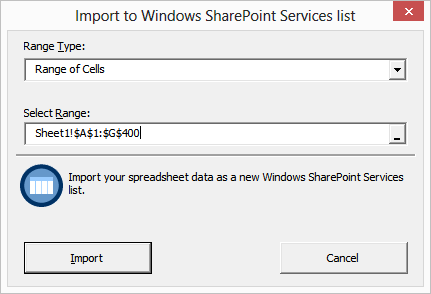 A client application that allows a user to keep files synchronized between his device and his online SharePoint document library. 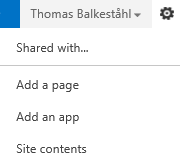 I do realize that Office 365 is the future for Microsoft, but when such a great feature is available, and it must be a rather easy task to get the functionality dynamic so that you can connect to any webfolder, it is a shame that the support for running Skydrive Pro as a SharePoint onprem has so little support. Please, do let me know if I am missing out on anything in the chart! What is SkyDrive Pro in SharePoint 2013 and how does it relate to SkyDrive?